If you’re an Apostolic rider (Jesus-name, Oneness Pentecostal) and you’ve not yet joined ASR, click here to learn more. If you would like to help provide crucial two-wheeled transportation to Oneness-Pentecostal missionaries overseas, click here to give to Motorcycles For Missionaries. To find your nearest ASR chapter, or to look into starting a chapter, click here. Your generous giving is tax-deductible, and it helps to further the cause of Christ. Use the donation buttons below to give to Motorcycles for Missionaries, to help with the ASR national board’s travel expenses (all members serve as unpaid volunteers and receive no reimbursements outside of the special fund below, which is supported solely by your giving) and with other ministry goals. Thank you for giving! NOTE: ASR Discussion now happens on Facebook! The board made an important and needful decision due to a litany of challenges the old site suffered from, including our available site tools being wholly ineffective against advanced spam-bot fake registrations. Please contact us if you have questions. Your former site login no longer works, unless you are a Rumblings Newsletter author, or an elected member of the ASR Board. However, you no longer need to login here for ASR discussion. Please consider using the Facebook groups instead (see above). The new ASR site provides functions necessary to our main site, such as how to join ASR, ordering items from the ASR Store, etc, but not discussion. 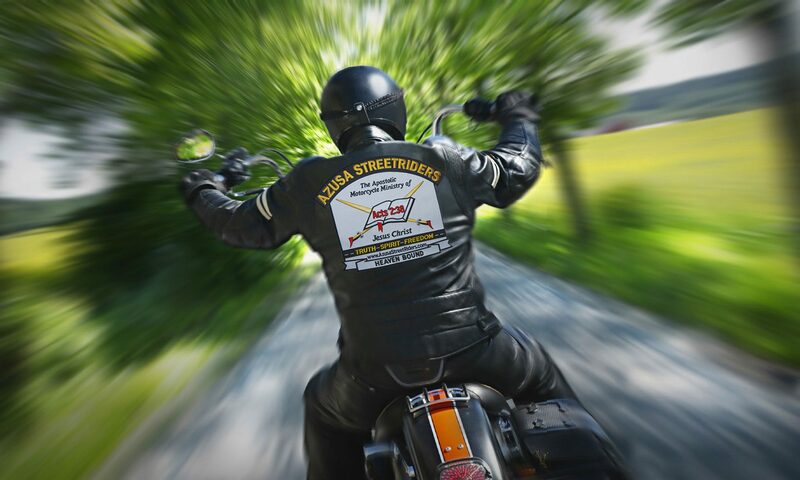 What sets Azusa StreetRiders apart from every other Christian motorcycle ministry or club in the world? We are bikers of — the name! And that name is — JESUS! Across the globe, nearly 700 Christian motorcycle ministries and clubs have been identified, but Azusa StreetRiders stands alone in professing and proclaiming the name of JESUS as the one name that fulfills all the qualifications of Matthew 28:19, the one name in which all believers are to be baptized (see Acts 2:38, Acts 8:16, Acts 10:48, Acts 19:5, etc. ), and therefore the only name by which we must be saved — even as the scripture says: “Salvation is found in no one else, for there is no other name under heaven given to mankind by which we must be saved” (Acts 4:12 New International Version). Please join our site, and we invite you to look around and get a feel for our ministry. Feel free to share any comments or questions that might be on your mind through our online posting area. We hope you will step out of your comfort zone and take an amazing journey toward getting where you need to be in your personal and spiritual growth. We hope you have a wonderful, anointed experience with us as we fellowship together. If you have a prayer request or are in need of prayer, we invite you to submit that need to us. Your prayer request opens the door, and God is waiting patiently on the other side of that door, at all times, in all situations, to join with you. Please help support your local chapter of the Azusa StreetRiders. All donations go to help in various ways including the purchase of motorcycles for overseas missionaries and many other outreach programs. Do you know of anyone who rides? Please invite them to come and join us for a ride! Everyone is welcome, and all makes and models of motorcycles are welcome also. Please have a look around, and thank you for stopping by!